I like plants. I don’t have quite the same affinity for them that I have for, say, dogs or cats, or wild birds, but I enjoy tending them and watching them grow. 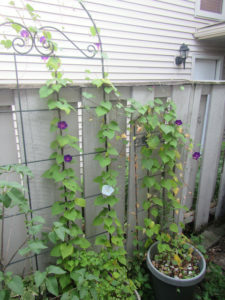 In our tiny, postage-stamp back yard, we’ve had pots that for years now have grown Morning Glories. We added a trellis behind the pots so the MGs would have something to climb, and every year they get to the top of the trellis and start to twine around each other, looking for ways to continue upward. In the fall, I fail every year to pull down the old vines, so the seeds from this year re-seed themselves, and the cycle starts over again the next spring. In some US states, Morning Glories are classified as an invasive weed, and it’s clear to me why: they’re tough to get rid of once you don’t want them any more! They also do well in poor soil, making them ideal to grow in many different places — as long as they have something they can climb to reach for the sun. 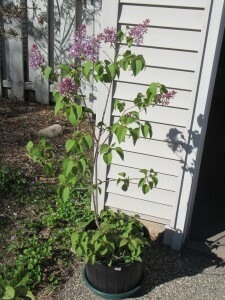 I took a cutting from the lilac bush outside my parents home several summers ago. My father had passed away that January, and it was clear we would be selling the house. I’m glad I took those cuttings: the new owners of the property ripped out those 50+ year-old bushes. One of my favorite childhood memories was waking up on spring mornings to the smell of lilacs in full bloom. The cutting I took has done well enough in a pot, grown from two feet tall to near five feet, and has even bloomed a couple of times, but I’m told they don’t do well in pots long-term, so I need to figure out a place to plant it permanently. I was inspired by THIS TED talk about plants that help produce oxygen and filter out harmful airborne chemicals to acquire some of the plants Mr. Meattle talks about. I bought a small Mother-In-Law’s-Tongue (Sansevieria trifasciata), which has grown from two small 6″ – 8″ leaves to nine, some of which are nearly two feet tall! I still haven’t been able to find an Areca Palm (Chysalidocarpus lutescens) locally, but I’m still looking. I tried gorwing an orange tree from seeds. I selected seeds from an orgamic orange, thinking it might have a better chance of sprouting. Some commercially gorwn plants that provide fruit and genetically manipulated to have seeds that aren’t viable, precisely to prevent people from planting and harvesting their own in competition with big agriculture. IN any case, it worked — the seed sprouted, and I have a nice Mandarin Orange tree that’s about a foot tall. It’ll be many years before it’s mature enough to flower and produce fruit, but I’m enjoying its lush green leaves, and its rapid growth spurts after I give it acidic plant food twice a year both fascinate and please me. Growing plants is a pastime I never thought I’d enjoy so much. While our house isn’t ideal for a home garden of any sort — indoors or out — seeing these plants grow and mature gives me a little joy every day. Once our house has cats once again, I may have to take steps to keep the plants protected from the predations of our feline overlords, but having green, growing things in the house makes me happy, so I’m going to keep at it. Good for you! I’m a hopeful gardener. Not always successful, but I do enjoy the process. Be careful with the mother-in-law’s tongue with the kitties – it is poisonous to them. Thanks for that tip: didn’t know that! I’ll have to keep the M-I-L-T carefully fenced off so any new kitties can’t get into it. Great to know you are a fellow gardner. After a long day of mental work at my job, I enjoy getting my hands dirty and tending my garden. Plus, I enjoy cooking, baking, and canning so garden fresh vegetables, fruits, and herbs are a huge bonus in the kitchen.